Where Does Time Go? aka Congrats to the College Grad! “Hmmm…well you don’t have a driver’s license yet, so not today,” I replied. “How old do you have to be to get one?” she asked. It doesn’t seem possible that she’s is a college graduate and will be starting her first “real” job in less than a week. She will receive her degree from DePaul which is in Chicago but she decided to bypass the commencement ceremony and we celebrated her graduation a week early in St. Louis. She made the suggestion to have her party at my parent’s home and make it a family gathering for a variety of reasons. It’s an easier trip for everyone involved, we didn’t have to worry about finding a place to have the party, and there wouldn’t be the additional expenses for hotels and restaurants. After we decided when and where the party would be she was faced with a dilemma, to “walk” or not to “walk.” The date of graduation fell on the same day as the wedding of one of her good friends. We had more than a few conversations about the pros and cons. In the end, I think the opportunity to spend time with close friends and family versus sitting for hours with thousands of people and no close friends nearby made the decision an easy one. 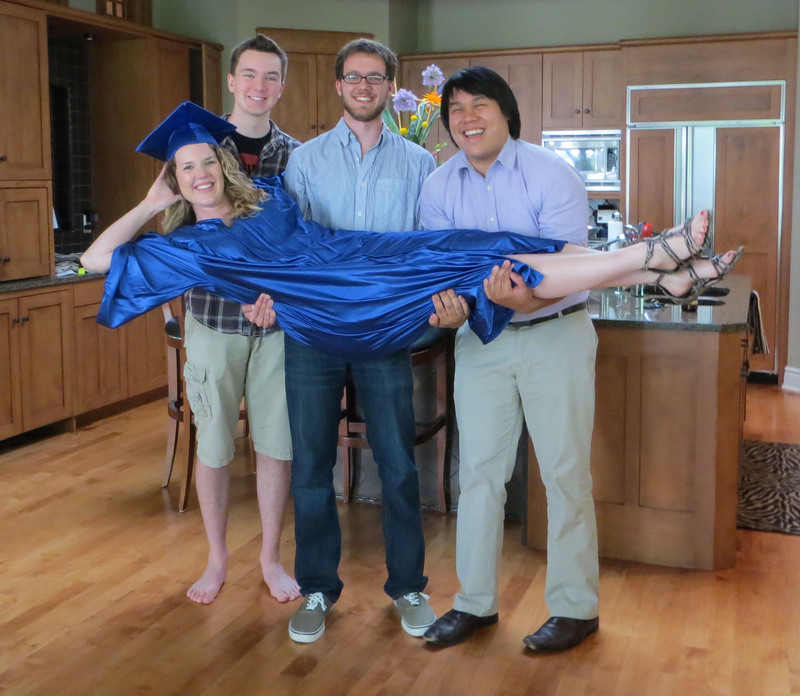 She would still receive her diploma and celebrate the event with two parties, but there was one missing ingredient. She wouldn’t have a picture of her wearing a cap and gown. I searched and searched trying to find the colors for DePaul and a place to rent a cap and gown on short notice. I’m famous for my mad Googling skills and have been known to find more than a few obscure but valuable pieces of information. Evidently I overcomplicated the search in this case. My mom replied to my email with the colors and website links in under a minute. I carried the FedEx envelope from the laundry room to the guest room where Katie was waiting for me and hoped I wasn’t holding a paper mache cap and a crepe paper gown. I think it took her less than three seconds to put it on and the smile didn’t leave her face for the rest of the day. Congratulations Honey! I am very proud of you. Awesome. Congrats to Katie and to her wonderful mom! Sadly I recall her being a wee child at the softball fields. I guess I’m not getting any younger, either! It’s hard to believe isn’t it. It was a great day and we loved having the party at our house. It was a great day! I was so happy we had it at your house. is right and there is no wrong answer – congratulations! Aww, I’m sorry. Didn’t mean to make you homesick, hoped to bring good memories. Wouldn’t it be a kick if we could meet up the next time you come to the states? No way dorky, the pure iconic image of graduation, a great idea. Congrats on a job well done to get her to this milestone. 🙂 She really did love it. Thanks Steve, I couldn’t be happier about her successes.